This lesson is easily adaptable for other communities in the world. Instructor may want to provide students with a scoring rubric that outlines science and research content. Reviewing the differences between weather and climate at the beginning of the activity is highly recommended. Community-based and could be combined with community mapping projects. Comments from expert scientist: activity treads the line between cultural and scientific knowledge, and in doing so places equal weight on personal interpretation of observations. Very little actual data-driven science is involved, but that's not the point. 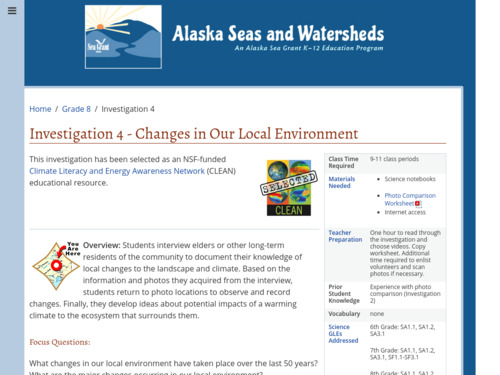 Activity certainly bridges the gap between climate change as a phenomena and cultural knowledge, and if pulled off could be very interesting at both educating the students and the community at large. The photo project especially has good potential to make climate change "real" to a young group of kids. This is an open-ended inquiry based activity. Students gain expertise in interview techniques and comparing historic environmental photos with recent photos. There is a great deal of support for the teachers and students in terms of interview and photo comparison techniques. These are some of the techniques being employed by scientists today to explore changes in climate. Uses the 5E/ inquiry model. Builds writing and communication skills. Students interact with elder and community members in a non-teaching situation and learn how to interview people. Nine to eleven class periods is a long time to spend on such a project, but there are many skills being learned and explored in these open-ended activities. In addition, it may be possible to decrease the class periods needed by encouraging students to complete much of the work as homework or an out-of-class project. Several of the resource links listed in the activity are no longer functional. Historic photos may need to be collected and scanned in if possible. There are video and image resources available but teachers and students will probably need to find some local historic images and scan them in.